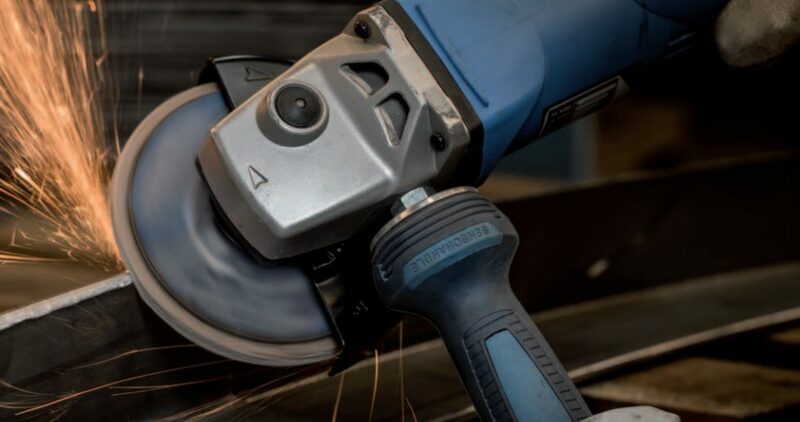 Grinding and Cutting tools | Repair Management Nederland B.V. 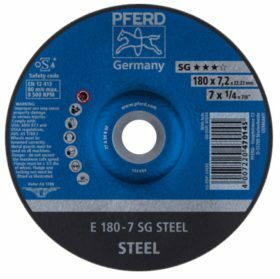 Established near Cologne, Germany in 1799, the PFERD brand name is synonymous with outstanding premium-quality tools and abrasives. 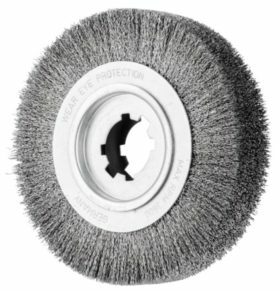 Today, we manufacture more than 7,500 PFERD brand grinding, cutting and surface finishing tools, and a complete range of Advance Brush power and maintenance brushes. 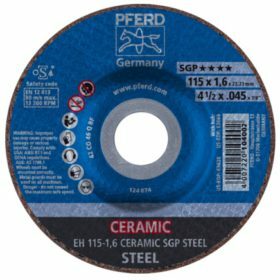 PFERD is pleased to announce that in July 2014, we launched our new Tool Manual, comprising over 7.500 quality products for cutting, grinding, and surface finishing. 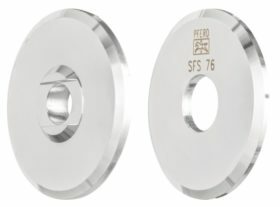 PFERD Clamping flange set for thin 180 and 230mm cut-off wheels. 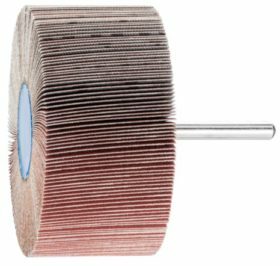 Increasing the lateral stability and precise guidance especially when using cutt-off wheels from 1.6 to 2.0 mm with diameters of 180 and 230 mm. 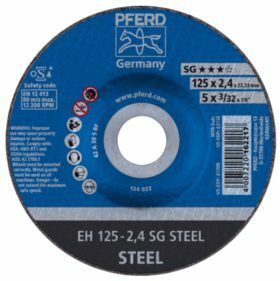 PFERD Flap discs for the best surface grinding. Available for Steel, Stainless Steel (INOX) and aother high alloy steel types and Aluminium. 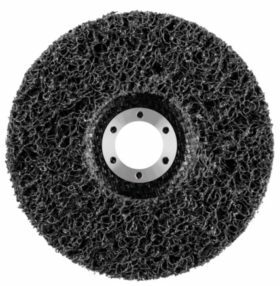 Same as with the grinding and cutt-off wheels are there 3 different ranges. The Universal Range, the Performance Range and the Special Range. 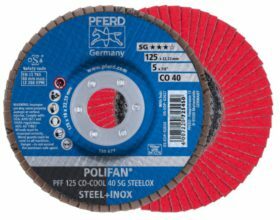 PFERD Flap Discs POLIFAN STRONG. 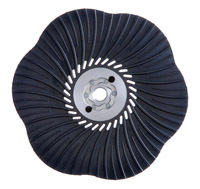 Due to its patented design, it offers significantly higher efficiency compared to conventional flap discs. Fast grinding through constant grinding aggressivenness down to the last abrasive grit. 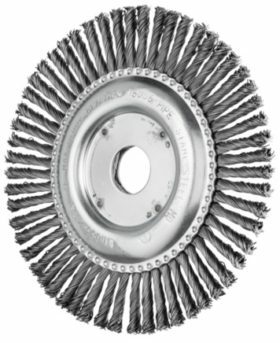 Ultimate economic efficiency thanks to maximum stock removal per time unit and less wear on discs. Extreme long tool life gives less tool change needed. 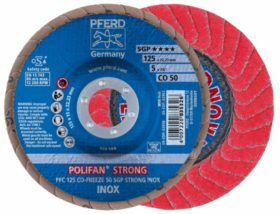 The PFERD POLIFAN CO FREEZE SGP STRONG INOX offers due to the ceramic oxide grain CO with active grinding and cooling special coating (FREEZE), there is no discolouration (even in thermally unfavourable conditions), so no reworking is required. Flying sparks are minimized. 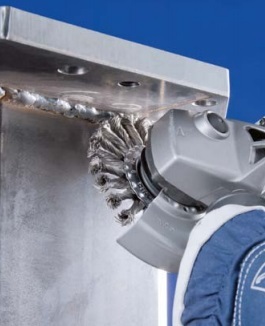 Damage to stainless steel workpieces from flying glowing sparks is therefore almost entirely ruled out. 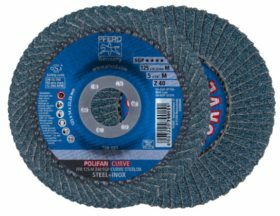 The patented PFERD Flap Disc POLIFAN CURVE has been specially developed for working in fillet welds. 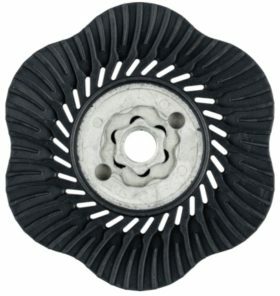 It is the only flap disc in the world that has flaps on both the grinding side and rear side, as well as on the radius. 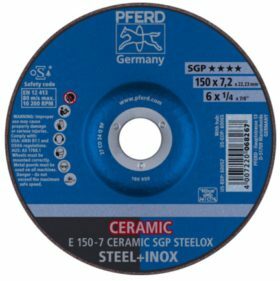 The Z SGP CURVE STEELOX type can be used on steel and stainless steel (INOX), the CO SGP CURVE STEELOX can be used on steel and stainless steel (INOX) and ensures low build-up of heat in the workpiece when used with minimum contact pressure. The A SGP CURVE ALU is specifically for Soft and Medium Hard Aluminium due to its Aluminium oxide A with active grinding, cooling coating. 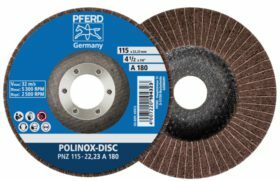 PFERD POLINOX Non-Woven Flap Discs are designed for working on large surfaces with speed-adjustable angle grinders. 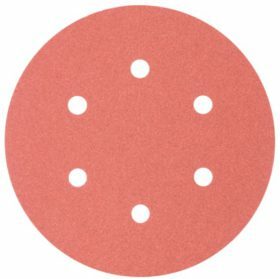 The abrasive flaps are stuck to a glass-gabric backing pad, meaning that the disc can be used face down. A long tool life is achieved through the dense packing of the flaps. Available as PLN & PNZ. 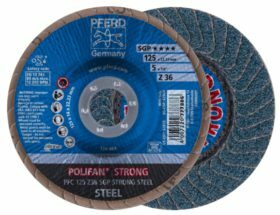 PFERD POLICLEAN discs. The Non-woven cleaning material is glued onto a glass-fabric base. 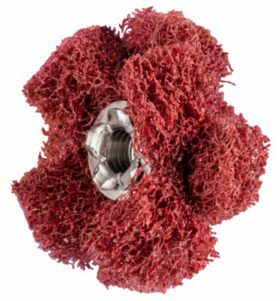 This makes the POLICLEAN suitable for use in face down grinding. 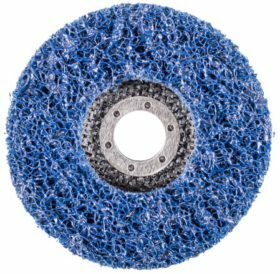 For coarse cleaning work such as removing paint, scale, heat discolouration, rust and adhesive residues. 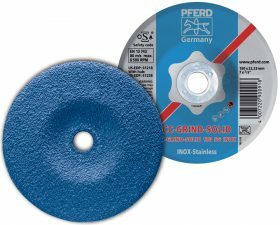 PFERD CC-GRIND Grinding discs, available as CC-GRIND SOLID (Steel & Inox), CC-GRIND-FLEX and CC-GRIND-STRONG with a unique three layer grinding system. 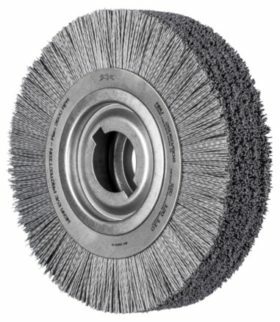 CC-GRIND has a reduction of Vibration and Noise of 50% and Dust up to 80% in compare with conventional grinding discs. 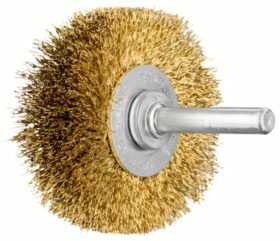 Pferd Shank mounted end brushes PBU suitable for light brushing such as deburring, cleaning and rust removal. Available with wire materials, Steel, Stainless steel (INOX), Brass and Plastic filament with silicon carbide. Knotted and crimped wire. 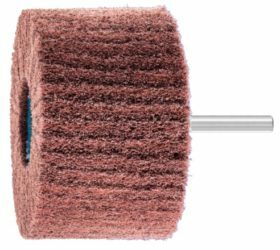 Pferd Shank mounted wheel brushes RBU suitable for universal cleaning, rust removal, smoothing, descaling, cleaning of cast seams, light deburring and removal of corrosion or paint. Available with wire material Steel, Stainless steel (INOX), Brass and Plastic filament with silicon carbide. Knotted and crimped wire. 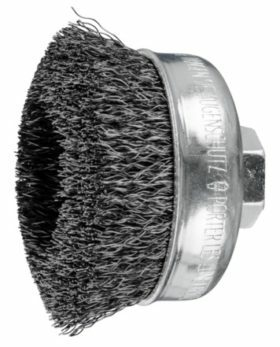 Pferd Cup brushes Shank mounted TBU and with M14x2.0 threaded connection TBG. 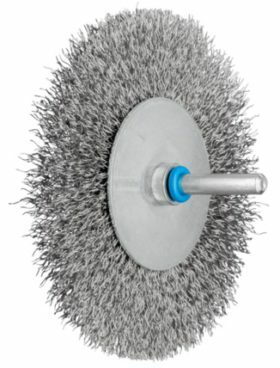 Excellent for medium-duty brushing on large surfaces, and deburring, cleaning and rust removal. 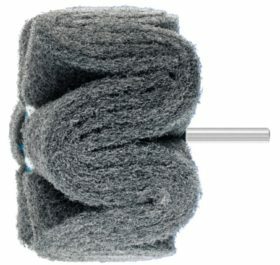 Available with wire materials Steel, Stainless Steel (INOX) and Plastic filament silicon carbide. Knotted and crimped wire. 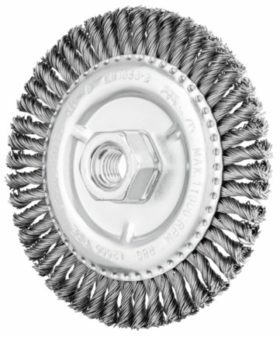 Pferd Wheel brushes RBG and RBG Combitwist with arbor hole 22.2 mm and M14x2.0 threaded connection. Available with Steel wire and Stainless steel (INOX) wire. 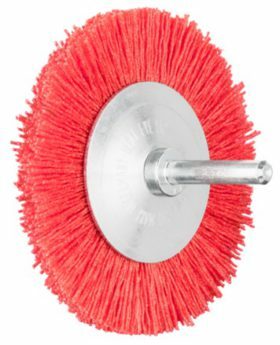 For aggressively heavy-duty brushing in metal work. 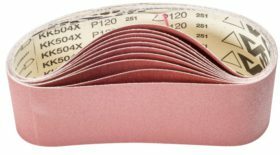 The special CombiTwist version for smooth operation, even on corners or edges. No recoiling of the brush when used on edges. Increased stock removal rate. 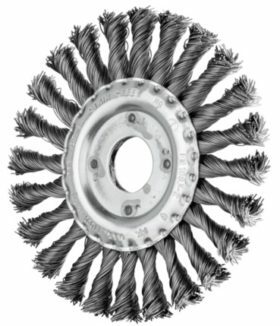 Pferd Wheel brushes PipeLine RBG PIPE is able to withstand high mechanical loads. 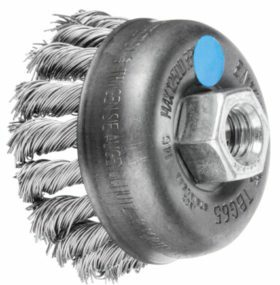 Perfect for heavy-duty brushing in pipeline and container construction. 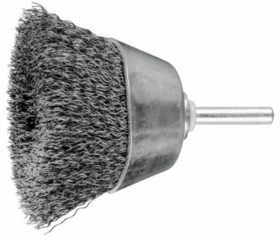 The extra slim brush design is ideal for work in hard-to-reach places e.g. root weld seams. Also available as CombiTwist PIPE version. 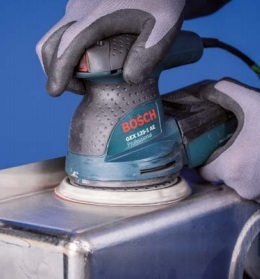 The CombiTwist brush reduces vibration in the angle grinder significantly. 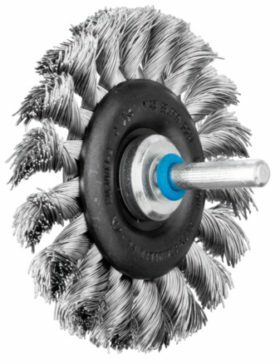 Pferd Wheel brushes RBU for stationary machines suitable for deburring pipes, cut edges and small parts. Available with Steel, Stainless steel (INOX) and plastic filament with silicon carbide or Plastic filament with ceramic grain. 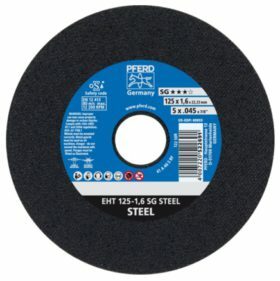 Emery cloth on economy rolls PFERD VSM, high flexibility, high tear strength and very good grit adhesion. 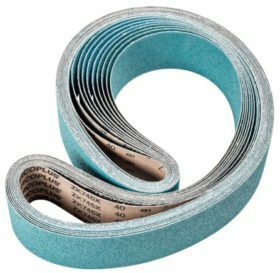 Useful for many applications on wood, steel, plastic and many other materials. Also available as sheets and emery paper sheets. 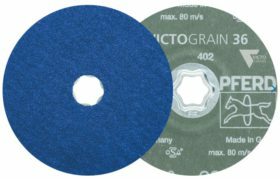 PFERD Fibre discs FS type and COMBICLICK CC-FS type. 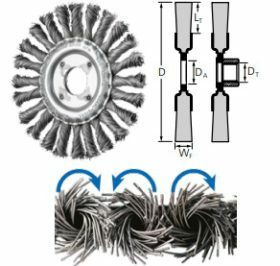 All available in multiple diameters, grit types and grit sizes. 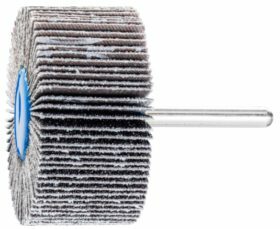 New is the VICTOGRAIN-COOL, for extremely aggressive grinding with an extremely long tool life and an outstanding stock removal rate on steels and materials which are hard or have poor heat conducting properties. 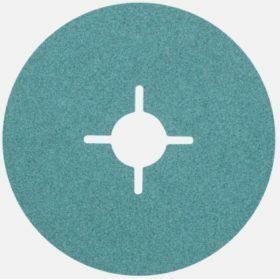 The COMBICLICK CC discs are easy to exchange due to the quick connection. 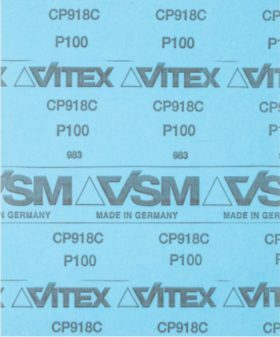 The special designed packing pads have a geometry with cooling vets prevents a high air flow for a significant reduction of thermic force on the surface of the workpiece. 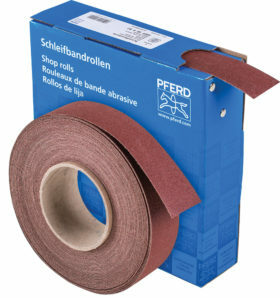 PFERD Long and Short Grinding belts BA, for universal, aggressive, coarse and fine grinding on standard belt grinders. Different grit types for all kind of materials. 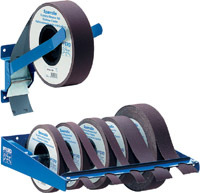 Also available as Non-Woven belts to achieve matt and satin-finished surfaces. 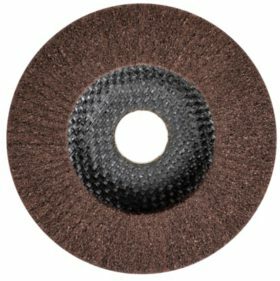 PFERD KSS & KSS-NET Velcro-backed abrasive discs. 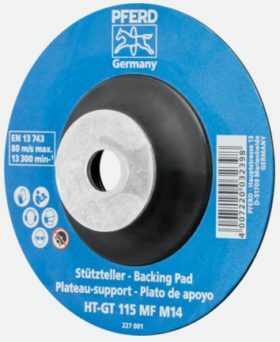 Suitable for fine grinding on large surfaces using eccentric orbital sanders. For use on metal, wood, plastic and paintwork. The KSS-NET can also be used on Stainless steel (INOX), aluminium, steel and cast steel. 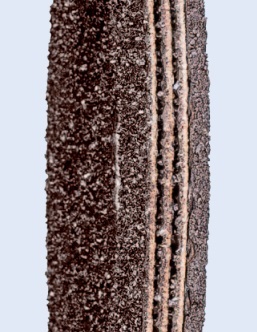 This NET type is very durable and due to the netting structure it has a good high tear strength and edge stability. 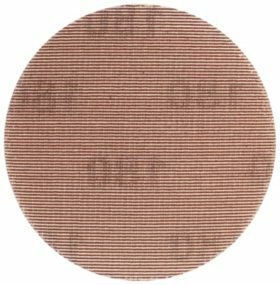 The KSS-NET type is available from grit 80 up to grit 1.000. 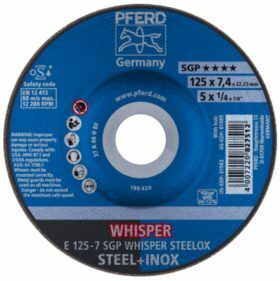 PFERD Shank mounted flap wheels Type F. Suitable for grinding in confined areas and hard to reach surfaces from coarse grinding to preparing polishing. Available for very small diameters Ø10 mm up to Ø80 mm with shank 3 mm and 6 mm in grit sizes from 40 up to 320. 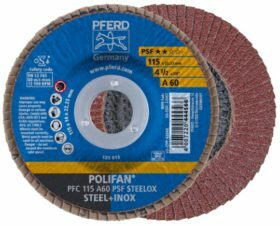 The PFERD Shank monted wheels with Non-Woven abrasives have an exceptional elasticity and a long service life. Are used for surface treatment on metals, cleaning of oxidated Non-ferro metals, depolishing and matt-finishing of Stainless steel (INOX) surfaces without visible transitions and roughening of plastics before bonding. Available in different grades, forms and structures. PFERD Files according to DIN 7261, available in many shapes, lengths and cuts. The machinist files are available with and without file handle. 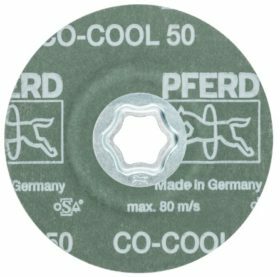 PFERD Tool drives. 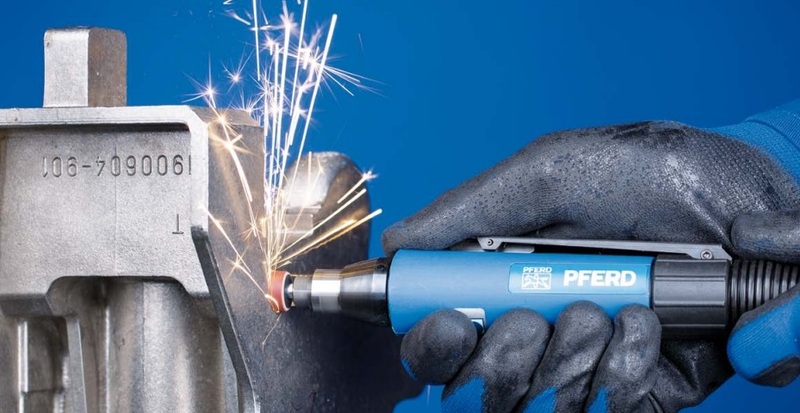 Pferd developed a complete range of tool drives which are the ultimate for their grinding, cutting and surface preparation tools. The tool drives are available in electric and pneumatic versions and as a separate motor with a flexible shaft tool. Using the right tool drive on the specific tool gives you the best performance and tool life.